+$See what’s inside the new edition of ImagineFX – on sale now! 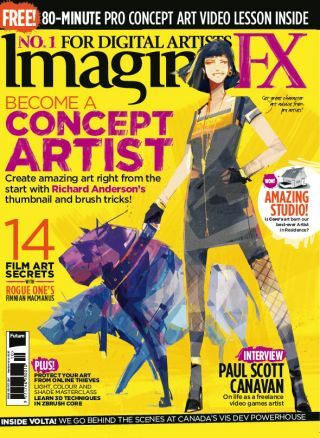 +$Learn how to start creating amazing concept art right from the start with the latest issue of ImagineFX magazine – on sale now. Inside issue 152 you'll also find plenty of tips and insights to help you break out of your artistic comfort zone and put some new techniques into practice. +$Buy issue 152 of ImagineFX here! +$Packed with outstanding artwork from our very own readers, the latest issue of ImagineFX is filled with all sorts of creative inspiration. On top of the latest news and product reviews from the world of digital art, we've got a whole host of headline features, which you can explore below. +$Who better to learn portfolio secrets from than an artist who worked on Rogue One? Here Finnian MacManus walks us through his tips for creating a strong portfolio of concept work that will catch the attention of film art directors. +$In the second part of our core skills series, artist Laura Bifano demonstrates how to mix a gouache colour palette to create a pleasing colour scheme. The process might require a bit of planning, but these techniques are sure to produce wonderful results. +$Over the years the rise of the videogame industry has led to more and more companies outsourcing their art requirements to specialist studios. We catch up with one such studio, Volta, to see how it has benefited from this trend. +$Fancy getting away from it all? That's what artist Justin Kaufman did when he moved from Seattle to the rural Pacific north west and set up shop in a barn. In our artist in residence feature he shows us around his new, unfinished studio.